This release speeds up cover art alternatives (the change art and cover art alternatives pages) which has slowed since the work to fix Discogs artwork download. Before, two queries were made for cover art, one with the tag information and one with the audio fingerprints. Despite the fact that the former always returned much faster, the results were not displayed until the fingerprint results had also been returned. So I've changed this such that all results are immediately displayed as they are streamed back to bliss. This means you get cover art alternatives much faster! I've also made further improvements to the "Browse" button. 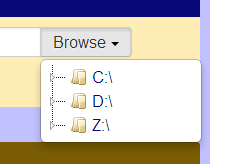 Windows users found that only their C: drive was listed, since I made some big improvements to the UI. Now I've made sure that all mapped drives are listed, such as those drives mapped to network locations. In addition the Music library fields, populated with your music folders that contain your music files, were being converted from backslash-separated to slash-separated folder paths. This was confusing for Windows users, so I've fixed it so that it obeys the platform conventions.